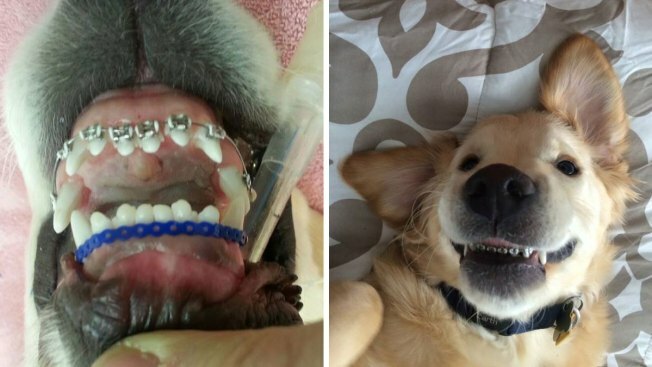 Wesley, a 6-month-old Golden Retriever, was fitted with braces to help him close his mouth properly. Like many "teenagers," Wesley is sporting a mouthful of braces. But his case is unusual, because Wesley is a dog. The 6-month-old golden retriever showed off his "metal mouth" in photos posted Feb. 26 on the Facebook page of Michigan's Harborfront Hospital for Animals. The pup is in good hands: his owner, Molly Moore, works at the animal hospital, and Moore's father is the dentist who took care of him. According to Moore, doggie braces are rare but not unheard of. She said Harborfront has fitted dogs with braces in the past. "Orthodontia in pets is normally not for aesthetic purposes, but because of health concerns," the hospital explained on its Facebook page. According to Harborfront, Wesley "needed tooth alignment because he could not close his mouth completely." Dr. Jim Moore said his doggie braces are made of the same materials used on people. "We use all human products, so this is something we’d put on a child," he explained. The cost varies depending on the kind of brace, but the ones used on Wesley typically run between $1,700 and $1,800, Jim Moore said. Wesley, however, got a discount. Molly Moore said Wesley doesn't seem fazed by the hardware and is "still his puppyish self," despite needing soft foods and being unable to play with his toys. "It obviously doesn't bother him one little bit," Harborfront wrote on Facebook. "He's a happy little guy." Wesley should get his braces off in a few weeks. February marked National Pet Dental Health month, and the animal hospital shared Wesley's photos to spread the word. Harborfront posted an update Monday saying the staff was "overwhelmed by the outpouring of care and interest from around the nation" for Wesley. "Dental care is just as important for the pets we love as it is for us and we are glad that his cute 'brace face' brought such interest," the hospital wrote.